Patients with type 2 diabetes often exhibit salt-sensitive hypertension, but the mechanisms underlying this association remain unclear. One potential link, Kelch-like 3 (KLHL3), regulates BP by targeting the serine/threonine kinases with-no-lysines (WNKs) for degradation, thereby modulating activity of the NaCl cotransporter (NCC). The authors previously found that phosphorylation at serine 433 (S433) in KLHL3 downregulates KLHL3 activity. 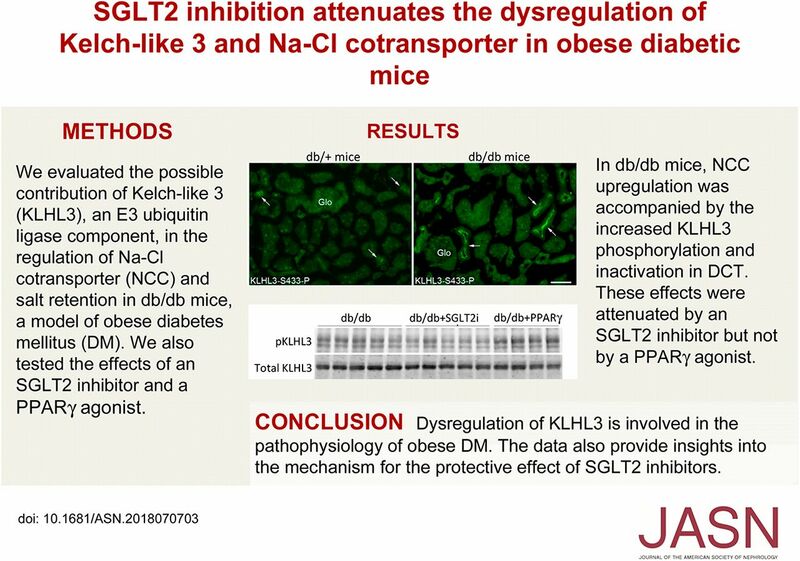 In this study, they show that protein kinase C–mediated phosphorylation of KLHL3 at S433 inactivates KLHL3 and increases NCC activity in db/db diabetic mice, and they show that an inhibitor of a sodium glucose cotransporter 2 (SGLT2), ipragliflozin, ameliorates this effect. These data indicate a previously unrecognized pathway by which dysregulated glucose metabolism stimulates renal salt reabsorption and provide insights into the mechanism for SGLT2 inhibitors’ cardiorenal protective effect. Background Mechanisms underlying the frequent association between salt-sensitive hypertension and type 2 diabetes remain obscure. We previously found that protein kinase C (PKC) activation phosphorylates Kelch-like 3 (KLHL3), an E3 ubiquitin ligase component, at serine 433. We investigated whether impaired KLHL3 activity results in increased renal salt reabsorption via NaCl cotransporter (NCC). Methods We used the db/db diabetes mouse model to explore KLHL3′s role in renal salt handling in type 2 diabetes and evaluated mechanisms of KLHL3 dysregulation in cultured cells. Results We observed PKC activity in the db/db mouse kidney and phosphorylation of serine 433 in KLHL3 (KLHL3S433-P). This modification prevents binding of with-no-lysine (WNK) kinases; however, total KLHL3 levels were decreased, indicating severely impaired KLHL3 activity. This resulted in WNK accumulation, activating NCC in distal convoluted tubules. Ipragliflozin, a sodium glucose cotransporter 2 (SGLT2) inhibitor, lowered PKC activity in distal convoluted tubule cells and reduced KLHL3S433-P and NCC levels, whereas the thiazolidinedione pioglitazone did not, although the two agents similarly reduced in blood glucose levels. We found that, in human embryonic kidney cells expressing KLHL3 and distal convoluted tubule cells, cellular glucose accumulation increased KLHL3S433-P levels through PKC. Finally, the effect of PKC inhibition in the kidney of db/db mice confirmed PKC’s causal role in KLHL3S433-P and NCC induction. Conclusions Dysregulation of KLHL3 is involved in the pathophysiology of type 2 diabetes. These data offer a rationale for use of thiazide in individuals with diabetes and provide insights into the mechanism for cardiorenal protective effects of SGLT2 inhibitors.